Feature packed and pocket sized, this black light torch boasts a 6 inch black light tube & torch in one pocket sized package. Stamp collecting, counterfeit detection, super charging glow-in-the-dark products, light up bugs and dust for first rate cleaning; this nifty hand held torch also exposes Selecta DNA for your forensic investigations and Smartwater. There are no end to the uses for this mini black light. But this nifty little gadget also features a bright torch as well. Use it to add some glow to anything with fluorescent colours on it - highlighter pens glow brightly under black light, as well as our brilliant range of UV items. 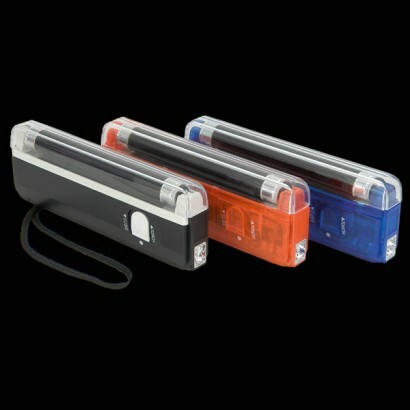 Pocket sized and powerful the pocket 4w black light torch runs on 4 AA batteries (not included) and it features a handy little click out leg so you can stand it up and pass items underneath the tube for inspection. Perfect for detecting fraudulent banknotes, stamps, credit cards and drivers-licenses. As a driving instructor/assessor I have to check licence (they have uv security features) and this torch is very easy to have with you all the time. I purchased this light to use with UV glow cream to demonstrate handwashing techniques. The light is not as powerful as I thought it would be & in order to see UV markers has to be very little residual light. Disappointing - but service from the company very good. The Glow Company Says: If you need a little more power, you might want to consider the mains powered UV Black Light Bulb. We also have the Inova X5 UV Torch which is specifically targeted for illuminating UV features in the 365 - 400 nanometre wavelength and works with Selecta DNA and Smartwater. Excellent piece of equipment. We use it to identify UV reactive sea glass and it performs perfectly. Service & delivery first rate too. I bought this blacklight for a section of my Honours project where I had to identifty worms in fish flesh and it works great, providing the worms with a blueish white appearance making it easy to pick them out. It could do with being a bit more powerful but for such a small little device it works really great. It's good value for money and the delivery of the product was extremely quick. Very impressed!